Aburaya ryokan can be found in Takahashi – a small city in Okayama Prefecture, towards the southern end of the main island Honshu. Nestled in a valley, surrounded by mountains, Takahashi is often used as a base for those visiting the nearby Bitchū Matsuyama Castle. We were here mid-winter, in early January, as an overnight stop before heading up Mount Gagyu early the following morning to explore Bitchū Matsuyama Castle – Japan’s highest castle. 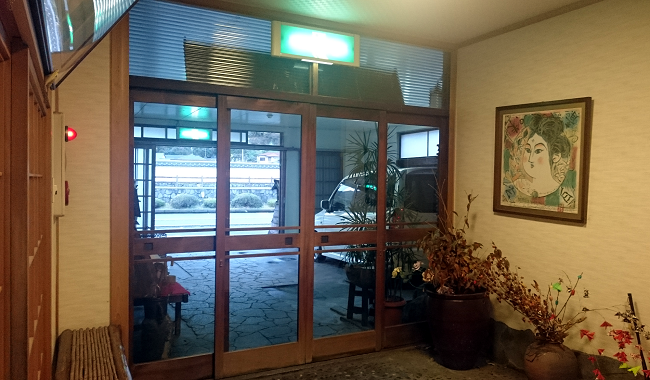 The Aburaya ryokan is 1.2km from Bitchu Takahashi train station (on the JR Hakubi Line) – a few minutes’ ride by taxi. As we were arriving early evening, staying just the one night, and heading off further on our travels the next day, Aburaya was chosen more for its convenience and price (starting at just 5,000 yen per person per night). Most of my ryokan experiences tend more towards the lap-of-luxury indulgence, mountain retreat or remote countryside ryokan. Instead of an idyllic, rural setting, this one was on a main road in the middle of Takahashi, but did at least overlook the Takahashi river the city is known for. 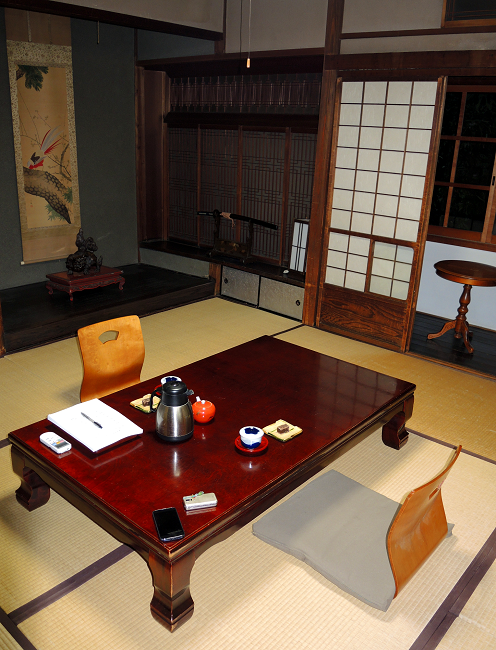 The ryokan first opened in 1910 (with the family behind it also active in business in the earlier Edo period). It isn’t anything special to look at, and it’s fair to say the ryokan interior has seen better days. Shabby (but without the chic), dusty in the corners and a little tired-looking, it nevertheless retains a certain amount of quaint period charm. Famous guests have included intellectuals and writers, most notably the poet Tekkan Yosano (1873-1935) who stayed here with his writer and pioneering feminist wife Akiko Yosano (1878-1942). 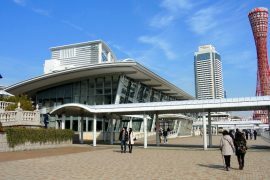 It has also been used as a location for a Japanese feature film. Our hosts helped set the tone for our stay, the husband and wife team who own and run the accommodation were especially friendly. They said they don’t get many non-Japanese staying with them but, even so, I was still surprised when they asked if they could take a photo of us when we left the following morning! The reception is furnished in a mixture of period Japanese and western wooden furniture. This is not uncommon in Japan, although most ryokan will usually choose one specific style and run with it. Still, what might have been a bit incongruous here actually works as all the wood is dark, tying everything in together well. There were four in our party. My wife and I, and my wife’s parents. It seemed like we may have been the only guests staying that night. 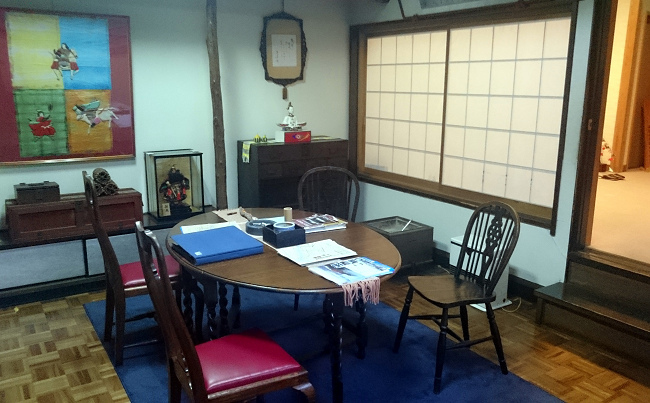 The room my wife and I had (on the first floor) was a quite large 8 tatami sized and authentically period. There was a tokonoma (area used for displaying items of artistsic appreciation), a slim balcony ‘room’ where there was a wash hand basin, which overlooked an exterior courtyard garden. In the main living room itself, on a stand next to the tokonoma, was an antique samurai sword. See: authentic! Thankfully, our room also had the more modern wall-mounted air conditioning unit. As the seasons become colder, like it was now, these units double up as heaters. This was perhaps the most welcome (if inauthentic!) sight. Our room was also equipped with a small TV, integrated ‘wardrobe’ for hanging our clothes, a small safe, telephone and his and hers yukata. Just the essentials, nothing more. It had been raining heavily during the day and we were soaked through. I emptied my rucksack, pulling out my passport which had warped from the damp, along with my notebook and other items. We drank our welcoming tea and ate the complimentary arrival sweets. Once the room warmed up a little we changed into our yukata to have a look around the ryokan. It didn’t take long. 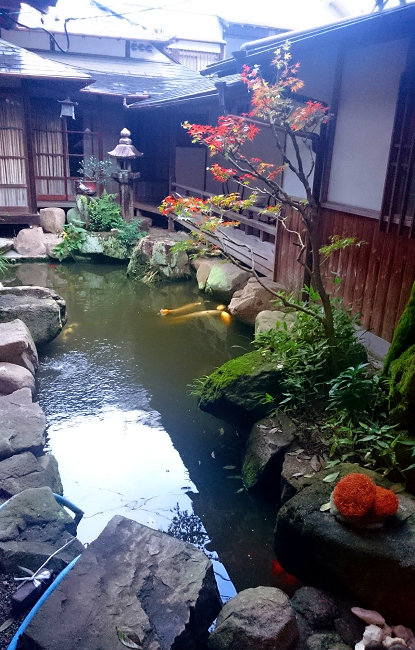 There’s no onsen attached to Aburaya and the only gardens appeared to be within the small internal courtyard we saw from our room. A garden to look at and contemplate, rather than walk around. A couple of the other rooms looked like they’d been out of use for some time (i.e. years) and the general impression was that the establishment was, at this time of year at least, only just making ends meet. 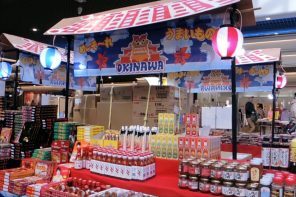 There was no gift shop – a common facility at many ryokan. There was no toilet in our room, there often isn’t in older ryokan, but a shared one was just a few steps along the hallway. The plumbing, like the rest of the building, was dated but at least it was a western style toilet. The bath was typical of an unmodernised ryokan, being a fully tiled, somewhat utilitarian rectangular slab of a thing. It served its purpose, if hardly invited lingering! For convenience, we opted for the evening meal plus breakfast package. Dinner was served in a dining room on the ground floor. For the four of us it was a bit on the ‘cozy’ side shall we say. More problematic was it was freezing. Fortunately, there was the familiar free-standing gas heater in the room so we fired that up rather than wait for our hosts to do so. Pre-heating a dining room is standard practise at a ryokan – so it was surprising and disappointing that we had to take the initiative. Our hosts seemed to be running the establishment single-handed meaning there were no waiting staff, so the husband and wife team were ferrying the multiple courses back and forth into the dining room from a hidden kitchen. 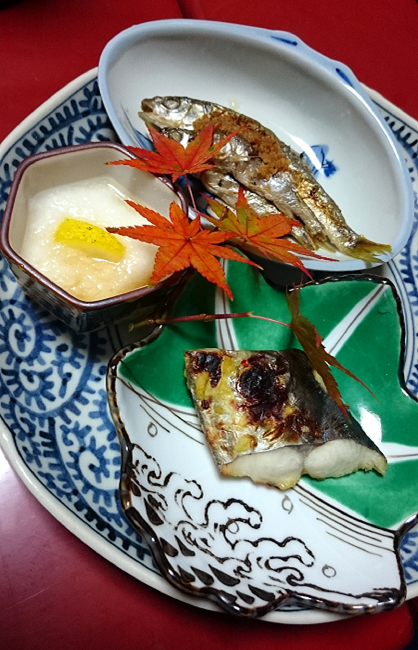 Dinner was typical ryokan style affair. That is to say it was a feast! Twelve courses in total. Whilst it wasn’t stunning it was pretty good, especially on a cold January evening. As always at ryokan, presentation was textbook stuff. Each dish carefully assembled in bowls and on plates specifically chosen to set-off the food. Every course photo worthy. 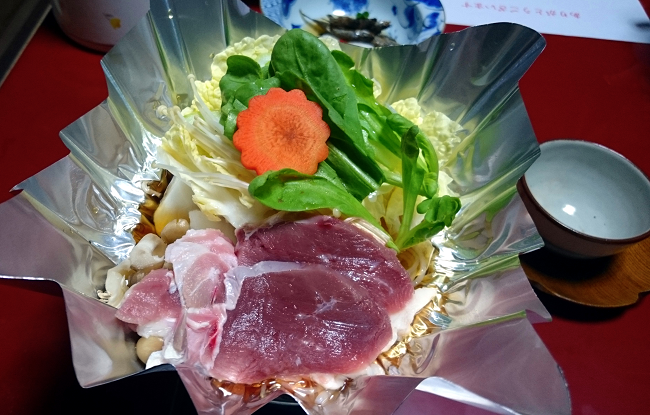 Highlights included grilled and then marinated whole fish, prawn tempura, wild boar nabe, a grilled (and deliciously oily) white fish, and a few choice pieces of sashimi. Our room was at the rear of the building – so farthest from the main road out front – and peaceful enough. Our futons for the ngith were laid out for us whilst we ate dinner (as is standard). Breakfast was served in a different room to dinner but was just across the hallway. It was larger so it could accommodate several guests at once. It was also cold when we sat down. Again, disappointing. Breakfast itself was classic ryokan. Multiple dishes, all served at once. As with last night’s dinner, there were a couple of options for the main focus of the meal. (You can express your choice when making the booking.) 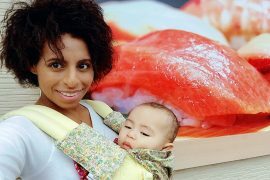 It was a fusion of East meets West, including grilled salmon, fried egg, kabocha (Japanese pumpkin – a personal favourite), miso soup, rice, pickled vegetables, a ham/tomato/cucumber salad, and more. Breakfast over, we packed and made our way down to reception. 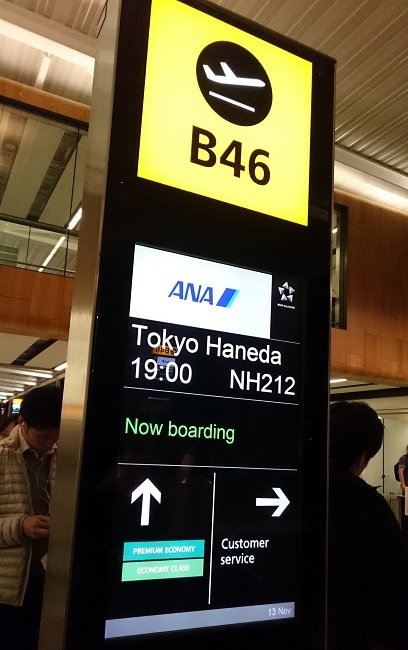 A taxi was booked through reception, to take us to the train station for the next leg of our journey. I settled up the bill. Prices for all-inclusive rooms (including dinner and breakfast) at Aburaya Ryokan start at 10,500 yen. Room only prices start at a reasonable 5,000 yen. Enjoying this article? Please spread the love by sharing this image ↓ on social media! As our taxi pulled up outside and our hosts carried our luggage out to be loaded in the car, the woman asked if we wouldn’t mind having our photograph taken. Seems they rarely get foreign visitors so wanted to commemorate that! 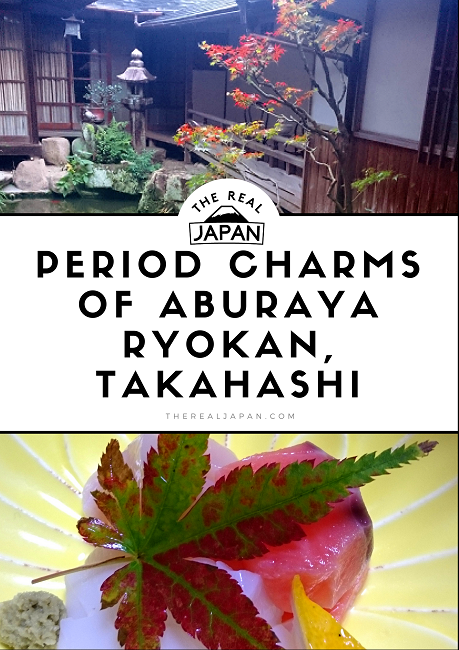 The location of ryokan Aburaya is ideal for exploring Takahashi. As it was booked as just an overnight stop with sustenance, it served its purpose well, but isn’t exactly what you’d call a destination ryokan. The counterbalance to its dated shortcomings was the infectious cheerfulness of our hosts. And, as Greek playwright Aeschylus said: “What is there more kindly than the feeling between host and guest?“. What, indeed? 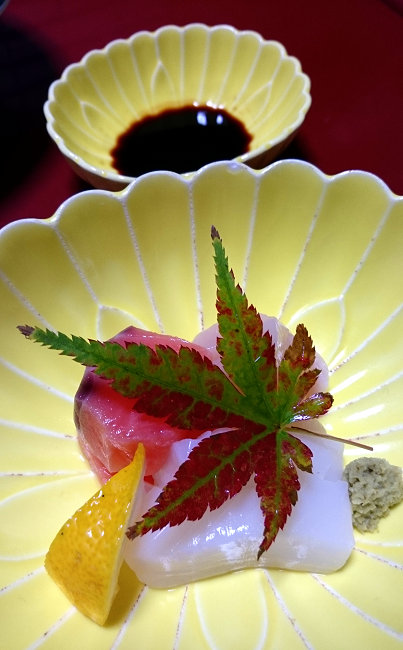 Several dining options are available for advance booking, including accommodation with Ayu cuisine, from 15,750 yen, Ayu ka-aka 3,150 yen, Akito kaiseki 6,300 yen and traditional tea ceremony from 5,300 yen per person.